The person who wants Generate Bulk E-way Bill then Go threw WEB PORTAL FACILITY. 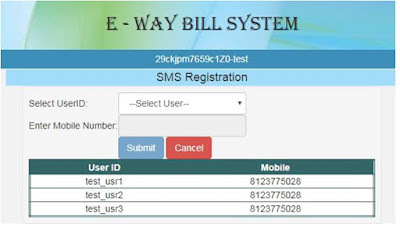 How to register SMS Facilities under E-way Bill? 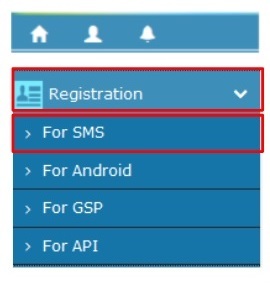 A maximum "Two Mobile Number" can Be Registered against "ONE GSTIN"
There are a set of SMS codes defined which can be used to work on the e-way bills generation/ cancellation. While using this facility, suppliers or transporter has to ensure that correct information is keyed in, to avoid any errors. 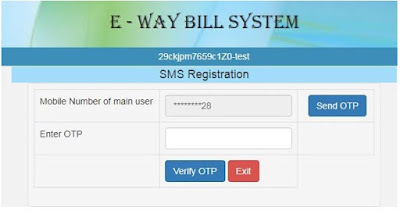 For example, EWBG/EWBT for Eway Bill Generate Request for suppliers and transporters respectively; EWBV for Eway Bill vehicle update Request; EWBC for Eway Bill Cancel Request are the codes. Type the relevant code for the desired action eg: Generation or cancellation and /or type the input against each code giving single space and wait for validation to take place. Verify and proceed. Mr. A of Bangalore, Karnataka delivering goods worth Rs. 1,00,000 bearing HSN code-7215, against an invoice he created- No. 1005 dated 27/01/2018 to a unit of Mr. B at Kolar, Karnataka through vehicle number KA 12 AB 2456 covering a distance of 73 km. "EWBT TranType SuppGSTIN RecGSTIN DelPinCode InvNo InvDate TotalValue HSNCode ApprDist Vehicle"
Sans Transports of Bangalore, Karnataka a GTA delivering goods worth Rs. 1,50,000 bearing HSN code-7215, on behalf of Mr. A of Bangalore, Karnataka, against the invoice – No. 456 dated 20/01/2018 to a unit of Mr. B at Kolar, Karnataka through vehicle number KA 02 AB 7542 covering a distance of 73 km. Suppose the vehicle breaks down during the journey on 20/01/2018 afternoon and Sans Transports arranges alternate vehicle bearing registration number KA 43 AB 2267 for the delivery of the consignment to the destination. Note: The eway bill cannot be updated with the vehicle details, If in case the validity of the eway bill expires eg. one day in case distance covered is less than 100 km. M.r A of Bangalore, Karnataka wants to cancel the e-way bill generated by him bearing number 160056750192. Errors are sent to the user as reply messages automatically. For example: “This e-way Bill is not generated by your GSTIN” and so on. Then make the necessary correction in the SMS and resend.